At LEAPChem, we proudly distribute the materials that are required for the wide range of our customers’ production processes. We understand that each production process is unique, which is why we provide custom services and chemical knowledge tailored to each customer specifically. With LEAPChem, you can look forward to receiving the operational benefits of working with an international company paired with the customer service and reliable follow up of a small business. LEAPChem - Pharmaceutical Chemicals is happy to highlight Bismuth trioxide, a very promising chemical in the global chemical market. Interest has centred on δ- Bi2O3 as it is principally an ionic conductor. In addition to electrical properties, thermal expansion properties are very important when considering possible applications for solid electrolytes. High thermal expansion coefficients represent large dimensional variations under heating and cooling, which would limit the performance of an electrolyte. The transition from the high-temperature δ- Bi2O3 to the intermediate β- Bi2O3 is accompanied by a large volume change and consequently, a deterioration of the mechanical properties of the material. This, combined with the very narrow stability range of the δ-phase (727–824 °C), has led to studies on its stabilization to room temperature. Bi2O3 easily forms solid solutions with many other metal oxides. These doped systems exhibit a complex array of structures and properties dependent on the type of dopant, the dopant concentration and the thermal history of the sample. The most widely studied systems are those involving rare earth metal oxides, Ln2O3, including yttria, Y2O3. Rare earth metal cations are generally very stable, have similar chemical properties to one another and are similar in size to Bi3+, which has a radius of 1.03 ?, making them all excellent dopants. Furthermore, their ionic radii decrease fairly uniformly from La3+ (1.032 ? ), through Nd3+, (0.983 ? ), Gd3+, (0.938 ? ), Dy3+, (0.912 ?) and Er3+, (0.89 ? ), to Lu3+, (0.861 ?) (known as the ‘lanthanide contraction’), making them useful to study the effect of dopant size on the stability of the Bi2O3 phases. Bi2O3 has also been used as sintering additive in the Sc2O3- doped zirconia system for intermediate temperature SOFC. Bismuth trioxide is commercially made from bismuth subnitrate. The latter is produced by dissolving bismuth in hot nitric acid. 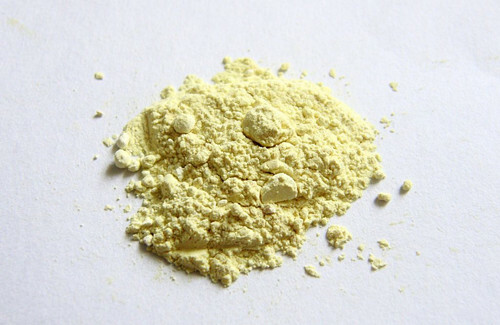 Addition of excess sodium hydroxide followed by continuous heating of the mixture precipitates bismuth(III) oxide as a heavy yellow powder. Also, the trioxide can be prepared by ignition of bismuth hydroxide. Bismuth trioxide can be also obtained by heating bismuth subcarbonate at approximately 400 0C. Bismuth oxide is occasionally used in dental materials to make them more opaque to X-rays than the surrounding tooth structure. In particular, bismuth (III) oxide has been used in hydraulic silicate cements (HSC), originally in "MTA" (a trade name, standing for the chemically-meaningless "mineral trioxide aggregate") from 10 to 20% by mass with a mixture of mainly di- and tri-calcium silicate powders. Such HSC is used for dental treatments such as: apicoectomy, apexification, pulp capping, pulpotomy, pulp regeneration, internal repair of iatrogenic perforations, repair of resorption perforations, root canal sealing and obturation. MTA sets into a hard filling material when mixed with water. Some resin-based materials also include an HSC with bismuth oxide. Problems have allegedly arisen with bismuth oxide because it is claimed not to be inert at high pH, specifically that it slows the setting of the HSC, but also over time can lose color by exposure to light or reaction with other materials that may have been used in the tooth treatment, such as sodium hypochlorite. If you are interested in Bismuth trioxide, click here to send an inquiry!